New Day heads to the ring. Big E and Woods talk about the new WWE Champ, Kofi Kingston. 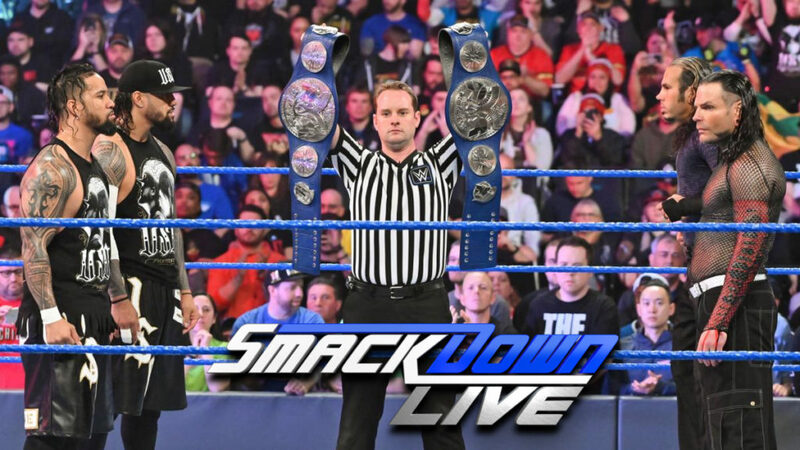 They also say that Kofi was very close to becoming a double champ on RAW, but there’s nothing like being home on SmackDown. Tonight isn’t about New Day’s usual nonsense, it’s about a celebration. Tonight, New Day is here to celebrate the career of Kofi Kingston. Woods talks about watching Kofi debut, then meeting his hero when Woods finally made it to WWE. Big E tells Kofi that he made history on Sunday. Woods, on behalf of everyone, congratulates Kofi. Kofi says that this is an impossible moment. He wasn’t supposed to win, but here we are. Kofi then introduces his family and thanks them profusely. The Bar interrupts and comes out to the stage. As The Bar walks towards the ring, they say Kofi owes them for interrupting the Winner Take All match on RAW and saving Kofi’s title. They also challenge New Day to a tag match. The Bar introduces their partner, Drew McIntyre. Good match. This was as fun as you would expect from these six men. Both teams took turns controlling the match, but the pace tended to pick up considerably when Ricochet, Black, and Ali were in control. I’d like to see this one match splinter off into multiple one on one matchups. After the match, Randy Orton appears in the ring and hits Ali with an RKO. Black and Ricochet pull Ali out of the ring. Rusev yells for them to leave when Kevin Owens appears in the ring and hits Rusev with a Stunner. Owens leaves the ring and walks up the ramp. Kayla Braxton welcomes The Usos. The Usos say they need to win against the Hardy Boyz tonight. They need to win not just to keep their titles, but also to prove that they can beat the Hardy Boyz. In the ring, R-Truth and Carmella talk about Wrestlemania. Carmella says that a lot has changed in the year since Wrestlemania 34. She lost the title she won, but she gained a friend in R-Truth. Carmella starts to talk more about her friendship with R-Truth, but Samoa Joe interrupts. Joe heads to the ring and attacks R-Truth. R-Truth tries to fight back, but Joe gets him in the Coquina Clutch. Joe throws R-Truth out to ringside and grabs a mic. Joe says he destroyed Rey Mysterio at Wrestlemania in seconds, and he might beat his next opponent in even less time. Braun Strowman runs to the ring. Strowman and Joe brawl. Joe puts Strowman in the Coquina Clutch, but Strowman breaks out. Strowman sets Joe up for a powerslam, but Joe escapes. Joe leaves the ring and heads up the ramp. We see a cardboard box. It’s smoking. Then a monster bird puppet thing comes out. Then the video ends. In the ring, The IIconics celebrate their recent title victory. They say that many people talk about being fighting champions, but The IIconics will actually follow through. So, they have set up a match with the best tag team they could find in Brooklyn, The Brooklyn Belles, Kristen and Karissa. This was fun. Clearly it was a joke, but The IIconics didn’t look bad in the match. Kayla Braxton asks Paige why she is on SmackDown Live. Paige says she wanted to get a close up look at the new Women’s Tag Champs. She says The IIconics looked good against the Brroklyn Belles, but Paige will be bringing an impressive tag team of her own to SmackDown next week. Shane McMahon heads to the ring. Shane talks about some of the memorable moments in WWE over the past few days. But whay did everyone tune in to Wrestlemania on Sunday? Because they all wanted to see Shane beat The Miz. Which he did. Shane then talks about Miz’s dad. George Mizanin apparently gave Shane a Black eye during his match, and that’s why Shane attacked Mr. Miz. The Miz and his dad got exactly what they had coming to them, and Shane proved that he is the best in the world. Shane calls Greg Hamilton into the ring. Shane wonders why Greg didn’t announce him like he did at Wrestlemania. Greg says that some fans threatened him if he called Shane the best in the world. Shane tells Greg that he doesn’t need to worry about fans doing anything to him, but he had better worry about the man standing right in front of him. Shane has Greg announce him again, but Shane is not satisfied. Shane grabs Greg by his tie and drags him up to the stage. Shane gives Greg one more opportunity to do his job correctly. Apparently, Shane is finally satisfied. Good match. I’m a little disappointed in the result, but the match was very entertaining. The Usos seemed a little off throughout the match. That led to some rare miscommunication, the Usos trying (and failing) to do some of the Hardys’ moves, and the Usos taking too much time. It felt like maybe the Usos were overthinking the match, and that actually made it pretty interesting. I’d like to see a rematch. Of course, with the result of this match, I feel like The Usos might be headed to RAW next week. After the match, Kayla Braxton enters the ring to get a word from the Hardy Boyz, but Lars Sullivan interrupts. Lars heads to the ring and attacks both Matt and Jeff. Sullivan slams both men and hits Matt with a diving headbutt. Becky Lynch heads to the ring. Becky talks about becoming Becky 2 Belts. She wanted to celebrate on Monday, but Lacey Evans punched her in the face. Lacey’s punch reminded Becky that she’s holding two big targets, but she says they can all come to challenge her. Becky says she’s walked through Hell to get her titles, and whoever tries to take them is going to meet a red devil. Becky leaves the ring, and Lacey Evans punches her in a sneak attack. Becky goes down, and Evans walks away. New Day, The Bar, and Drew McIntyre are in the ring for a match. Sami Zayn comes out to the stage before the match can begin. Sami thinks for a second, then he decides that the crowd isn’t worth speaking to. Sami leaves, and the match starts. Good match. It was short, and I’m surprised that McIntyre wasn’t a bigger factor, but it was fun regardless.This was a night to celebrate Kofi and New Day, and I think this match did that. Both RAW and SmackDown felt like a bit of a rest for WWE. There were a few surprises, but the shows weren’t crazy. They were just fun. Coming off of a huge Wrestlemania and still a week before the rosters get shaken up, this was a good time to just be happy with the new champs we have. On this show, I didn’t care about the Shane McMahon bit. I thought it was entirely pointless. That segment could have been used for someone else. Other than that, I liked the show. Despite wanting The Usos to retain the titles, I enjoyed this match the most tonight.